Learn how Brafton helped one client boost its Twitter follower count, increase engagement and drive referral traffic to the company homepage. Pinnacle Business Systems Inc. is an industry-leading provider of information technology solutions that has designed scalable solutions for customers across industries for more than 26 years. Pinnacle focuses on providing clients with the expertise needed to assess, implement and manage information technology initiatives. Based in Edmond, Okla., Pinnacle has offices throughout the Central U.S. to provide hands-on customer service to Fortune 1000 companies, private firms, local governments, healthcare providers and small to mid-sized companies. Marketing Programs and Event Manager Stacy Yates was already taking advantage of Brafton’s basic social automation package, but she knew it would be valuable for Pinnacle Business Systems to invest in a content-driven social strategy. She participated in Brafton’s Social Media Madness contest and won – receiving a free month of premium social service. With a recommendation from the Brafton team, she selected Twitter, and the campaign increased the brand’s followers, improved overall engagement and drove referral traffic to the website. When Pinnacle Business Systems first partnered with Brafton in 2012 to fulfill its content needs, Yates was one of the few people on the company’s small marketing team working to update Pinnacle’s website and build its social presence. Because Pinnacle Business Systems already had a content strategy in place, it had plenty of information to share – it was a matter of distributing it on the right channels in the most effective manner. To promote the brand’s content and engage a wider social audience, Brafton’s strategy targeted industry insiders, thought leaders and knowledgeable readers in the commercial IT space. It also aimed to build a community around the brand’s expertise to foster engagement and discussions with interested users and thought leaders. Brafton’s social team established a significant social presence for Pinnacle Business Systems, drawing content from the company’s blog, as well as sharing relevant industry tips. The social media strategists responsible for Pinnacle’s accounts increased the company’s online footprint substantially, putting the Pinnacle Business Systems brand name in conversation with industry leaders. 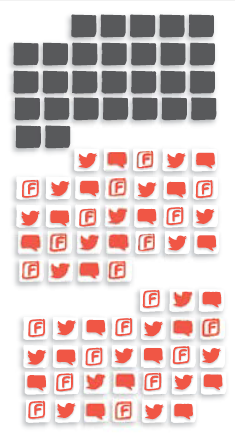 It also drove more traffic to Pinnacle’s website, as sessions that began on Twitter increased over 77 percent. 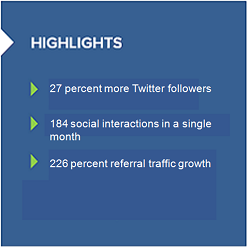 The average number of pageviews for referral traffic from Twitter exploded, growing over 2,000 percent in a month, as interested audience members looked at the company’s content. Pinnacle wants to maintain social momentum it built in just one month. There’s still a lot of data to pore over, but it looks like Pinnacle Business Systems has room to grow on Facebook and other social networks besides Twitter. Companies can always increase their influence online, and Pinnacle is poised to drive even more traffic to its social profiles.